Artful, Love filled... 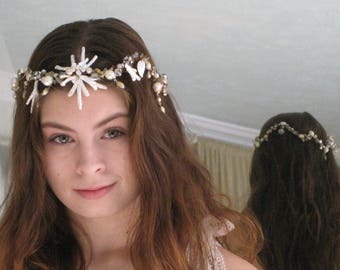 Wedding dresses, sashes and headpieces. Our Studio is open by appointment :) If you live in or near Atlanta or want to travel, call Robyn 404-788-0069. 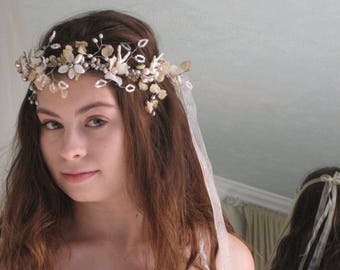 Hippie Bride consists of two best friends, Nina Sands and Robyn Meek. We are "Cottage Industry", making everything by hand in a 1936 red brick cottage. 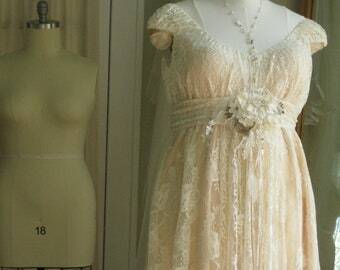 We've been creating ARTful, unique, alternative, vintage inspired wedding gowns & accessories for almost 30 years. We pour our hearts and the energy of Love into everything we create. "One of a kind" is what we're all about. 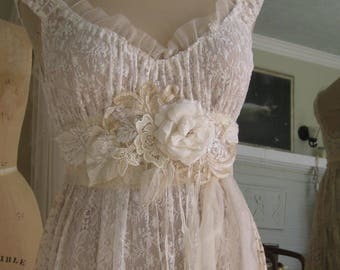 Our dresses, sashes and headpieces are created using many repurposed materials ... vintage lace tablecloths, rescued elements from antique gowns, antique and vintage laces of all kinds, trims, baubles and beads. 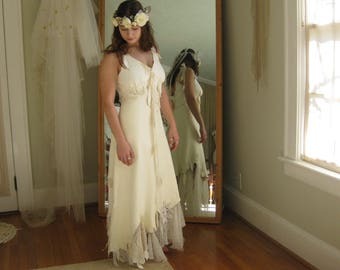 The majority of our pieces are made from pure inspiration, but we do occasionally make a custom gown. Hand painting, hand beading, color, leather and feathers are some of the details found in our dresses. There is something magical about wearing a piece that is just for you alone. How do you want look and feel for your ceremony? We want you to look amazingly gorgeous, but how a dress or anything you wear makes you feel on the Inside is what you will cherish. We are grateful for the gift to create and to be able to share our art with the world. We hope you are inspired to be yourself. After all, there is only one you in this world. Our intention is to help you express that. Thank you for spending your time with us and sharing your energy.